Lock in a great price for River Cree Resort & Casino – rated 8.8 by recent guests! What an perfect weekend away ! It was my birthday and all of the staff were absolutely amazing. We were greeted in our room with a yummy piece of birthday cake with strawberries and a personally signed birthday card ! I was blown away! Wow! I felt very special. The food in the restraints was delicious and the casino floor was very entertaining. It was our first time seeing a concert at the casino and the venue was very intimate ! We had a great time. Thank you. I liked that the casino was just a skip away, and there’s a few options for food! Location was excellent, was greeted with very friendly staff. Any encounters I had with staff on site were very pleasant and helpful. The food at all the restaurants on site was excellent!! Will recommend and definitely stay again! Room was spacious the entertainment venue was a good size. The multiple choices for food was good. From start to finish it was a great experience. It was a girls night away and I could not recommend it more. We ate at the Kitchen Buffet and really loved it! All well maintained. Very helpful front desk staff. Rooms are clean. River Cree Resort & Casino This rating is a reflection of how the property compares to the industry standard when it comes to price, facilities and services available. It's based on a self-evaluation by the property. Use this rating to help choose your stay! One of our top picks in Edmonton.Located on a 49-acre estate just off Highway 2, this luxury Enoch hotel features an on-site casino and 5 restaurants. Free Wi-Fi is available in public areas. 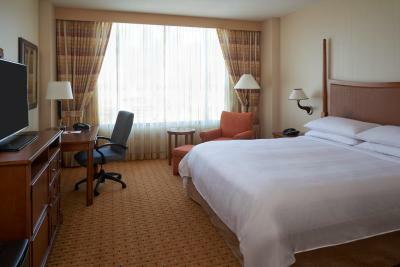 Floor-to-ceiling windows and a flat-screen TV are found in each modern room of the River Cere Resort & Casino. A microwave, fridge and coffee maker are also included. Among the River Cere Resort & Casino's 5 restaurants, Kitchen Buffet & Bistro offers a choice of world dishes made in front of guests. Sage steakhouse, Tap 25 Sports Bar and The Center Bar are open to adults only. 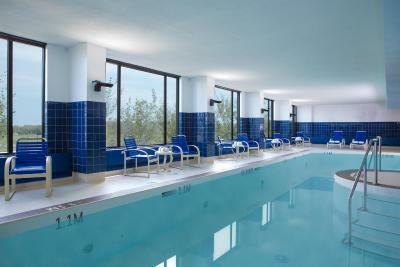 A large gym, hot tub and indoor pool are open to guests who wish to work out or relax. Two on-site hockey rinks can also be reserved for games and skating. The River Cere Resort & Casino offers free shuttle service to West Edmonton Mall, less than 4 mi away. The Royal Alberta Museum is 23 minutes away. When would you like to stay at River Cree Resort & Casino? Features a flat-screen TV with in-room game and movie rentals. 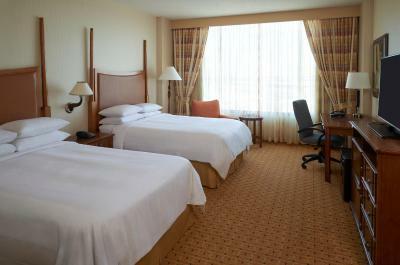 This twin/double room features air conditioning, seating area and cable TV. This quadruple room has a seating area, microwave and air conditioning. This double room features a soundproofing, microwave and seating area. This quadruple room has a flat-screen TV, soundproofing and microwave. This suite features a soundproofing, air conditioning and microwave. This suite has air conditioning, soundproofing and microwave. 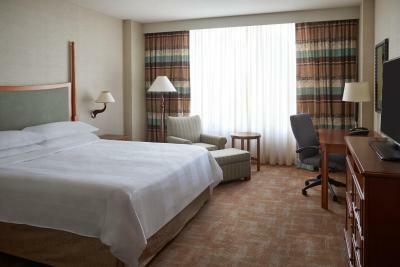 Book a rewarding stay at the Edmonton Marriott at River Cree Resort. 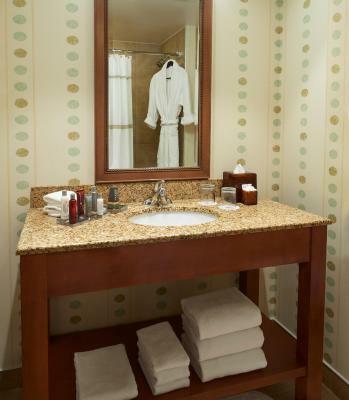 Our luxury hotel offers superior amenities for your west Edmonton, Alberta visit. House Rules River Cree Resort & Casino takes special requests – add in the next step! River Cree Resort &amp; Casino accepts these cards and reserves the right to temporarily hold an amount prior to arrival. River Cree Resort & Casino accepts these cards and reserves the right to temporarily hold an amount prior to arrival. Toilet paper was not restocked as we had to get one from the cleaning people before they cleaned our room. Rick Springfield. What a show! One of the best concerts I've ever been to. Only buffet (about $35+/person) was offered in the main restaurant for supper on the Saturday evening - you could not order off the regular menu. Restaurant in the casino had limited options and was also quite pricey. I phoned earlier in the week to ensure this gift for my brother's 65th, with concierge services would be explained. This was neglected and my brother was not aware he had privileges including continental breakfast. I was disappointed as we paid a lot for the room to make it special. Comfortable, clean, upscale. Able to have a few drinks and gamble without worry. Just the smoking in the casino. Hair in the shower. Stains on the headboard. Very pricey for the quantity of room. The meals over all were good but pricey.